UPDATE JANUARY 2018: due to health reasons, owner is now OPEN TO OFFERS, contact us for details !!! Great investment to own a Swiss company with 69 room hotel & 12 luxury apartments ( + garages & 5000 sq m building plots) ! Sale is by shares. Perfectly suitable for an upgrade to a Boutique Hotel or medical wellness resort, there are no restrictions on the use of the property and hotel. 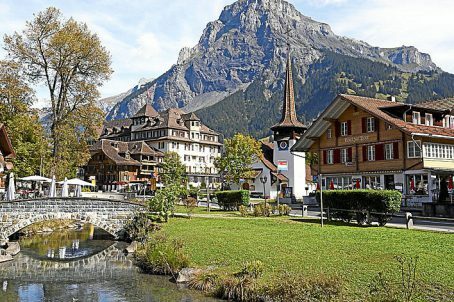 Charming Historic Resort Hotel & Spa in the centre of a Swiss alpine village, in the heart of the Bernese Oberland, surrounded by a large park, familiar atmosphere combined with the best Swiss hotel tradition. The hotel has 69 rooms with 3 restaurants, a ball room, childrens playroom, Indoor swimming pool and spa centre. In a seperate building there are 12 luxury apartments with a total of 24 bedrooms. the property has a car park, garage building and 29 car underground parking (lease revenue). Total land is 7167 sq m. As the total land area is in construction core zone A, the property could be developed further and another 2 to 3 buildings could be constructed.